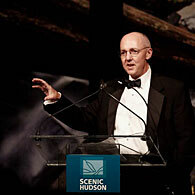 At our May 20 Gala we celebrated Fred Rich's six years of sterling leadership as Scenic Hudson's board chair. The evening culminated with Fred receiving the Franny Reese Medal, Scenic Hudson's highest honor. Like Franny, Fred loves to share his passion and unquenchable spirit for protecting our natural treasures. At the Gala, so many of us were moved by his eloquent remarks. I'm honored and delighted to share them with you. As chair of the land trust for almost 20 years, and Scenic Hudson for six, I've had to make lots of speeches. You have patiently sat through many of them: I've talked about Ned and our splendid staff, the ecological and cultural importance of the Hudson Valley, reconnecting the valley with the city, saving farmland and many other topics. So tonight, I've chosen something different, something that you haven't heard before, and you'll be glad to know that it's a simple thought and thus very short. Many of you know that I am a keen gardener. Gardening for me is a type of active mediation, and a few weeks ago I was puttering in the garden thinking about the lessons of history, and what historical perspective might teach us about the current situation. Civilization is not inherited: it has to be learned and earned by each generation anew; if the transmission should be interrupted for one century, civilization would die, and we should be savages again. It's a striking thought. Just one century—less time than Kathryn Davis has been alive. If we turn our backs on learning, on pursuit of the true, the good, the beautiful—then we hit the reset button on civilization. And indeed we see this now in various places around the world—where that learning and earning of civilization has been interrupted, savagery does indeed erupt. As Margaret Thatcher famously said, it's lurking there right below the surface. So what I'm asking you to do tonight is to think about the conservation movement in a different way: not simply as the preservation of the physical world, but as a critical part of this imperative to "learn and earn" civilization. Ken Wilber has said that "it is not the forces of darkness, but of shallowness, that everywhere threaten the true, and the good, and the beautiful. It is an exuberant and fearless shallowness that everywhere is the modern danger." At root, I think this is the danger that many of us find so profoundly disturbing about our present political and civic life. "Exuberant and fearless shallowness" pretty well captures the popular culture of reality TV, Twitter as a substitute for reading and writing books (or even complete sentences), and the culture of the shopping mall and suburban sprawl. The conservation ethic, on the other hand, stands in sharp contrast to these forces of exuberant shallowness. The conservation ethic is grounded in the conviction that nothing is more authentic than nature, and nothing more salutary for mind and body than a life lived in harmony with the natural world. It arises from and promotes the profound anchoring provided by a strong connection with place. And the conservation ethic cautions against spending our natural capital for short-term gain, and demands that we treasure and protect natural beauty. In short, I believe that the conservation ethic tells us how to make choices that protect and advance human civilization. In a world where so much political discourse has completely lost the anchor of truth, Scenic Hudson is dedicated to grounding our most important policy choices in sound science and careful analysis. In a world where the entertainment culture has captured the majority of our waking hours and relentlessly celebrates ignorance and superficiality, Scenic Hudson is equally relentless in seeking to reconnect the people of the Hudson Valley to the truly authentic delights of the natural world around us. And in the landscape of suburban sprawl—where the dangerous illusions of the shopping mall and the mega-church provide so many Americans with their only sense of community and connection— Scenic Hudson is building an alternative to this disastrous way of living, an alternative model in which healthy communities connect people with each other, with the natural world, and with a profound sense of place. When Alexis de Tocqueville visited America in 1835, he was astonished by the number and variety of private organizations at every level of American life—what today the academics call "civil society." Today, Americans give over $300 billion each year to non-profits, and the independent sector employs almost one in 10 American workers. No other country in the world comes close. It is one of the few things that make me optimistic about America's future. De Tocqueville would have well understood Scenic Hudson, and tonight's event—people getting together, motivated by the common good, trying to do the right thing. It's not the government or corporate sector, but this vibrant civil society, which shoulders most of the burden of "learning and earning" civilization. As most of you know, I travel frequently around the world for my law practice. In the last eight weeks I've been in Russia, the Middle East and South East Asia. As much as I love the Hudson Valley, I have to admit that what we are doing together here, in the context of the entire world and its many problems, may be a small thing. But for me, Scenic Hudson, and the cause of conserving this one remarkable place, has loomed very large in my personal pursuit of a rewarding and well-lived life. Wordsworth reminds us that "getting and spending, we lay waste our powers." But what we do together under the umbrella of Scenic Hudson is not a waste of our powers. Instead, it allows each of us to contribute to that vital work of keeping the march of civilization moving in the right direction. I am most grateful to have had the opportunity to do that work together with all of you.